The footage has been doing the rounds on social media - watch the freak accident below. 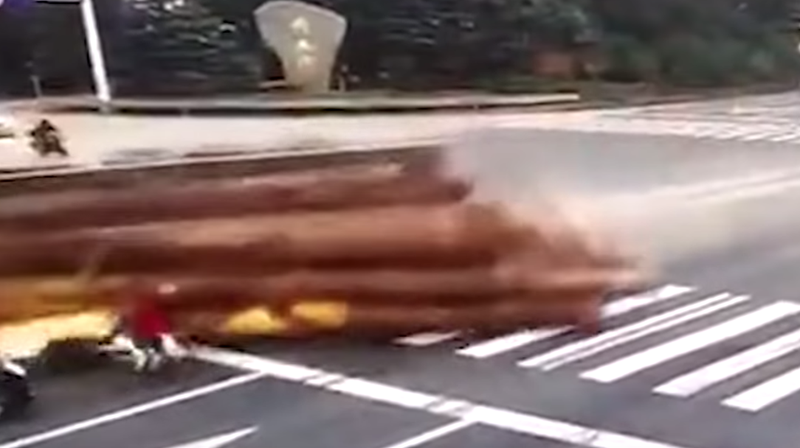 Logs hit motorists on a highway / Youtube. The CCTV footage shows how a truck driver tried to swerve out the way in an attempt to avoid hitting a motorcyclist. The truck driver from the East of China's attempt was unsuccessful. While swerving out the way, the logs that were being transported came loose and hit oncoming traffic. A motorcyclist died in the freak accident, while the passenger who was at the back of the motorcycle and another road user were rushed to hospital. Huisgenoot reports that their condition is stable.